Providers of services to people with developmental disabilities may be self-employed individuals or agencies. All providers must be certified through the Ohio Department of Developmental Disabilities (DODD) before they can provide any services. Perhaps you have heard by now that there is an exciting new resource for rating providers of services for people with developmental disabilities in Ohio. It is called ProviderGuidePlus. This easy-to-use, online system provides an opportunity for you to rate your provider and learn how others have rated their providers. ProviderGuidePlus is intended to help people select a provider and help to improve services overall. More information about how to use ProviderGuidePlus site, can be found here. Your opinion and your experiences count! Please consider submitting a review so that other families can benefit from your input. You can log-on and rate your provider using a simple 5-star system. Your rating and comments will then be posted on the site without showing your name. Type the name of your provider in the search box. Click “Add an Anonymous Review” on the provider’s profile page. You will be prompted to create an account. Creating an account is simple and be assured that your review will remain anonymous. When you want to make additional reviews, you will log-on using your account information. Rate and review your provider based on the services you receive from them. Indicate whether or not you would recommend your provider. After submitting your review, we would really like to hear what you think about ProviderGuidePlus. On the home page, clicking “Tell us what you think about ProviderGuidePlus!” will take you to a brief survey. Your valuable feedback will help us make sure this new resource was helpful and easy to use. If you have any questions about ProviderGuidePlus, you can contact the Perry County Board of Developmental Disabilities at (740) 342-0416. Thank you for taking the time to participate in ProviderGuidePlus and for your interest in improving services available to people with developmental disabilities. 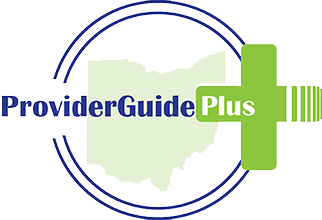 ProviderGuidePlus is sponsored by the Ohio Department of Developmental Disabilities, the Ohio Association of County Boards and the Ohio Provider Resource Association.